Hülya Kayserili, MD. PhD., is a professor of medical genetics and chief of the Medical Genetics Department and Diagnostic Center for Genetic Diseases at Koc University School of Medicine (KUSoM), İstanbul, Turkey. Dr. Kayserili’s area of expertise is clinical genetics focusing on neurogenetics and prenatal genetics, and she is an experienced clinician on rare single gene disorders and dysmorphology. Dr. Kayserili’s group investigates the etiopathogenesis of rare, very rare craniofacial dysmorphic syndromes and limb malformations. 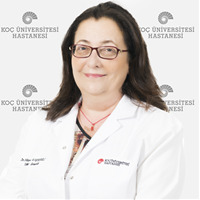 Prof. Kayserili is ITC co-leader of Neuro-Mig Network Work Group 1 (WG1).